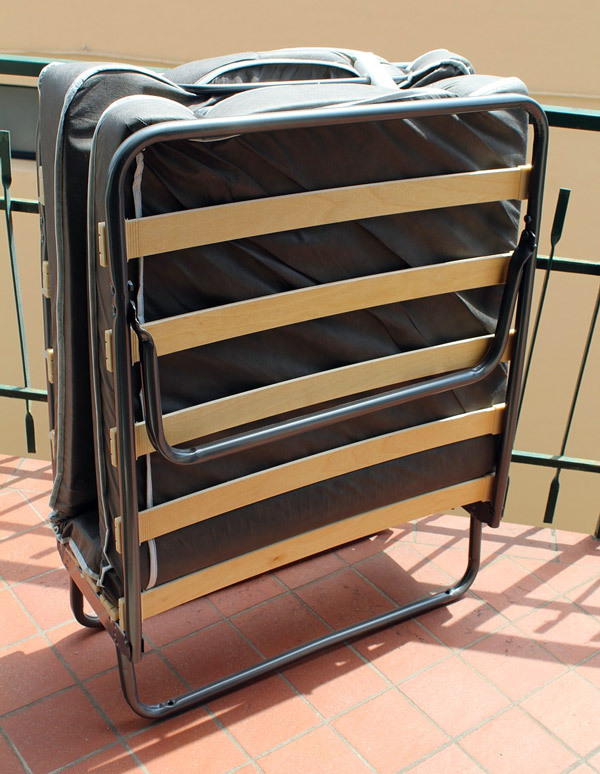 Folding rollaway beds are a great alternative to guest beds. A folding bed offers both comfort and convenience. It can be pulled out when needed for guests then folded and roll away when your guests go home. A good folding bed is much more comfortable than the average futon or couch, giving sleepers the complete support and comfort of a bed. Guests will appreciate having a real bed to sleep on, and you can enjoy the extra storage space when you fold up the bed and store it away. When shopping for folding beds, you have a variety of options. Some foldable beds are designed for daily use, with high-quality mattresses and durable frames. Others are designed with price and convenience in mind, folding up easily for convenient storage. The right folding bed should be able to last for years, be comfortable and come at a reasonable price. Here, we review some of the best folding beds available and go over the pros and cons of each. The LUCID Rollaway Guest Bed is a folding bed that offers superior comfort and a variety of features to enhance your guests’ sleep experience. This folding bed comes in a variety of sizes, making it a versatile option for your guest bed needs. You can choose between the cot size (31 inches by 74 inches), twin size (36 inches by 74 inches), and an XL twin size (36 inches by 78 inches). This is a wider variety of size options than other folding beds, making the LUCID Rollaway Guest Bed an attractive option if you plan on accommodating guests that need extra space. All sizes of the LUCID Rollaway Guest Bed come with a 4-inch foam mattress. The mattress is made up of three inches of support foam and one inch of memory foam, giving a good amount of support and providing the body-conforming comfort that memory foam is known for. It’s not too firm and not too soft, with a medium feel. The LUCID Rollaway Guest Bed has an innovative frame design. The bed can easily be folded up, and wheels on the bottom of the frame allow it to be rolled away smoothly and stored. 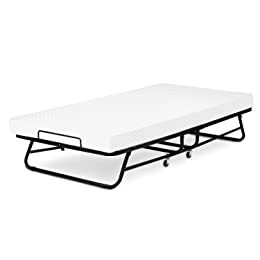 In addition, the base of the bed has a spring-supported poly deck, offering support with greater comfort than a folding bed frame with wood or metal slats. You can rest assured that this bed is high quality, thanks to the foam mattress’ CertiPUR-US certification and the 10 year warranty that comes with the LUCID Rollaway Guest Bed. This is one of the longest warranties available for any folding bed. Millard Diplomat’s twin folding bed is a standard metal frame with four legs that lock into place. The lattice base helps support the memory foam mattress, and when it folds up, it secures in place with no storage struggles. There are a few things we love about the Diplomat. The latticework helps solve a common foldaway bed problem, sagging. The middle of the mattress experiences some stress in folding, but the latticework ensures that the mattress is adequately supported across the entire surface. Memory foam makes it more comfortable than a standard coil mattress. It’s thin like most foldaways, but the memory foam is a lot more supportive with contouring on your pressure points. It’s CertiPur-US certified, so there’s little off-gassing despite it being memory foam. The four secure legs lock into place when it’s out, and the clamshell style fold secures with a trident bolt. You can adjust it to accommodate different mattresses. It’s just 14 inches across when it’s all folded up. Unfortunately, it can be a bit tricky to unfold with some of the legs needing maneuvering into place. The buckle closure is secure, but it can also be challenging to engage. If it isn’t snapped together correctly, the bed can come open while it’s in storage. 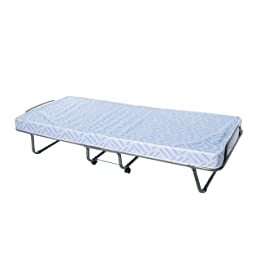 The Coleman ComfortSmart Cot is the perfect folding bed for camping, dorm rooms, or the occasional overnight guest. This bed is inexpensive and no-frills, but does exactly what it needs to, offering a convenient, easy-to-store bed. The Coleman ComfortSmart Cot has a sturdy frame with stretched canvas to support the mattress. The mattress is relatively thin, but made of comfortable foam. With its heavy-duty steel frame, this bed supports the weight of the average adult easily. Though its small size is convenient for storage and transport, the Coleman ComfortSmart Cot can only accommodate a person 5’7” or less. The mattress measures 69 inches by 25 inches, making it one of the smallest folding mattresses available. A larger person will likely not be able to sleep comfortably on this bed. However, the Coleman ComfortSmart Cot is perfect for kids or smaller adults, especially when you consider the low price. This folding bed is designed for camping, so it’s durable and able to withstand the elements, and folds up small enough that it can fit in the trunk of an average car. 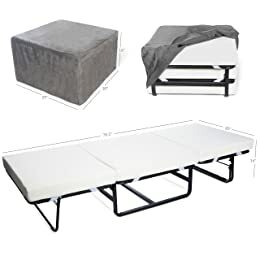 Throw the Coleman ComfortSmart Cot in the car and take off for a weekend camping trip, or let the kids bring this folding bed along on a sleepover for a good night’s sleep. With its durable construction, light weight, and smaller size, the Coleman ComfortSmart Cot is ideal for camping trips or kids’ sleepovers. 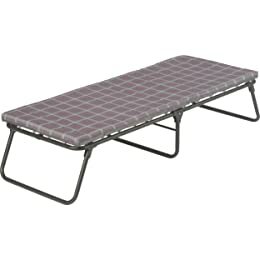 The low price makes this folding bed an especially attractive option for those on a budget. The iBed is a convenient and budget-friendly option for those looking for a simple folding guest bed. This bed unfolds quickly and comes ready-to-use, with no assembly required. 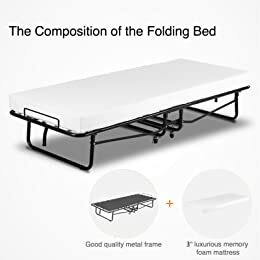 It’s significantly cheaper than other folding beds, too, making it an attractive choice for those who need something to use only for the occasional guest. The iBed is comfortable, too, with a spring supported mesh base, so there are no wood or metal bars poking your guests when they sleep on this bed. The bed also comes with a 2-inch foam mattress that’s supportive yet soft enough to sleep through the night on. With a sturdy frame made from tubular steel, the iBed is durable enough to last for years to come. The frame is still light, however, weighing just over 25 pounds with the mattress on top. This makes it incredibly easy to fold away and store. In addition to its lightweight frame, the iBed is also easy to store thanks to its size. When folded, this bed is under six inches tall and slides easily under a bed or in a closet. When unfolded, the bed is 32 inches by 74 inches—smaller than the average twin bed, but still spacious enough to sleep on comfortably. 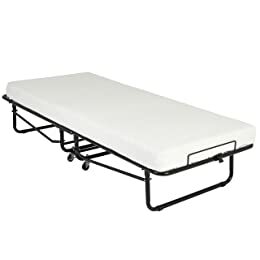 Though it’s smaller and offers less support than other folding beds, the iBed is still a great option, especially if you know you won’t be using your folding bed often. The iBed is affordable, lightweight, and easy to store, while still offering plenty of comfort. The Traveler Premier folding bed is truly one of the premier folding beds available on the market today. This folding bed offers superior comfort paired with the convenience of a folding bed. The Traveler Premier folding bed ranks high among folding beds thanks to its size. While most folding beds are only 30 inches wide, the Traveler Premier folding bed is a full 38 inches wide and 75 inches long, making it the size of a standard twin bed. You’ll enjoy the extra room this bed offers, ensuring you have plenty of space to spread out and get a good night’s sleep. You won’t have to sacrifice comfort with the Traveler Premier folding bed either. The mattress on this bed is a luxurious four inches thick, with one inch of pressure relieving comfort foam and three inches of high-density base support foam. This combination is the perfect balance between comfort and support, offering plenty of both. The foam in the Traveler Premier is guaranteed to stay fresh, thanks to the natural ingredients added to this special memory foam. Green tea extract ensures the foam smells fresh, while active charcoal eliminates odors and absorbs moisture, keeping the foam perfectly dry. Plus, this foam is CertiPUR-US certified, guaranteeing its durability, performance, and content. To add extra support, the Traveler Premier’s frame features a strong metal grid support. This metal frame is sleek and understated and provides a solid base for the mattress. The grid supports also prevent the mattress from sagging, ensuring that your Traveler Premier mattress will last for years to come. The Traveler Premier Folding Twin Guest Bed comes with a 1 year warranty, guaranteeing the quality of this mattress. The Milliard Folding Bed is larger than most folding beds, but with that comes added durability and sturdiness, making it a solid choice for a guest bed. This bed is high quality and durable. 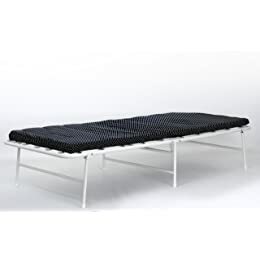 Used by many luxury hotels and resorts, this folding bed is the ultimate in comfort and is sure to last for many years, even with constant use. The Milliard Folding Bed comes with a comfortable 4-inch premium foam mattress, providing plenty of support. 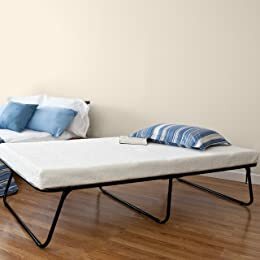 It feels just like sleeping on a regular bed, with a strong wire mesh that supports the mattress and allows it to hold the average adult easily. The mattress measures 31 by 74 inches, making it smaller than a twin size bed, but still large enough for most people. Weighing only 27 pounds, the Milliard Folding Bed is lightweight and easy to store. A hinged lock bar keeps the bed folded securely. With its high quality Italian craftsmanship and durable frame, the Milliard Folding Bed is an excellent choice for those who are expecting a lot of guests. Zinus’s foldaway is a simple metal frame with three legs for stability. It features a cot style support with springs and a sturdy canvas base. It supports a weight limit of up to 250 pounds. We love the construction and mattress of this one. The canvas foundation prevents sagging in weaker parts of the mattress, such as the fold. It also helps adjust to weight by giving a bit as you lay down. The foam is very comfortable and is CertiPur-US certified. It won’t produce any off-gassing, and at 2.5 inches of pressure relieving foam (four inches total), you should find it a lot more comfortable than the couch. When it’s folded, it fits into smaller space such as underneath a bed or a taller couch. It’s excellent for short-term guests and is easy to operate. However, the cot style foundation might be uncomfortable for long-term guests. The cot style is a lot easier to maneuver than a pull-out or a larger fold-away bed, but the cot style just isn’t going to be as comfortable. Millard’s folding ottoman is an excellent option if you don’t have a lot of storage space. It’s a cot sized foldaway that becomes an ottoman when not used as a bed. If you don’t have a huge living room, it’s an incredibly efficient use of space. Not everyone has space underneath the bed or under a couch, so this lets your foldaway hide in plain sight. It uses a tri-fold system that’s very supportive. The frame is metal tubing with a broad center base. The CertiPur-US memory foam relieves pressure points and feels a lot better than conventional spring mattresses. It doesn’t produce off-gassing and won’t inflame respiratory allergies. Each separate section has a washable cover, and the ottoman cover itself is also washable. Pay attention, however. It’s a bit smaller than a twin size, so larger sleepers may have some issues. Your standard sized sheets won’t fit exactly either. The ottoman is a bit heavy, so if you’re moving it by yourself, take care that you don’t cause injury. The weight may be difficult for some people. Best Choice’s cot folds up to just ten inches wide. 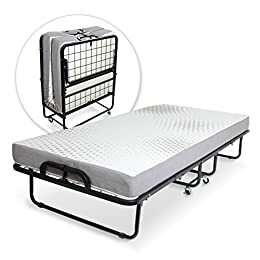 It uses two metal support bars and a cot style foundation to support the mattress. The three-inch memory foam mattress is comfortable for short-term use. We like a couple of things about this one. The size of the cot makes it really suited to long-term storage. If you don’t have a lot of guests, but want to be ready when you do, this one may be a good option. The mattress is only three inches thick, which may not be enough for some guests, but it does fold more easily than other, thicker mattresses. It has wheels on the bottom, and the base is attached with 32 carbon steel springs. The wheels lock into place so it won’t move around unless you need it to. It will support up to 300 pounds. Weight and size might be issues though. It supports a good amount of weight, but the size may not be conducive to larger sleepers. It’s smaller than a twin, so you may have to make peace with excess fabrics because twin sheets are a little big. The springs and fabric are supportive, but they have a tendency to tear if too much pressure is applied. Make sure that no one jumps or sits down too hard on the bed. Mecor’s folding bed uses a sturdy metal frame with a cot style foundation. It uses a center support for stability and is easy to assemble. Wheels! Wheels are amazing. They help get the bed moved from place to place. They’re sturdy and mounted on casters for easier movement. It can support up to 320 pounds, a substantial weight limit. Compared to most foldaways, this is an improvement. The mattress is memory foam. The clamshell design folds easily with a trident buckle to secure it together. You can adjust the buckle to accommodate different types of beds. It’s very comfortable for a few nights, but your guests may not want to sleep on it long term. It is firm, so if you have some back pain, it shouldn’t make it any worse. Unfortunately, cot sizing means you won’t be able to fit your standard twin sheet without a little bit of tucking. If the excess material doesn’t bother you, it may not be an issue. The bed has a pretty low height, and the cot style foundation can be difficult after a few nights. It has a high weight limit, but it’s a little bit shorter, so making use of that weight limit may be tricky. 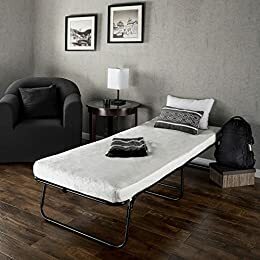 Folding beds are a fantastic choice when you need a bed that’s comfortable enough for guests to sleep on, but still easy to store when your guests leave. With a wide variety of options, there are folding beds available to meet any need and any budget. Whether you want to use your folding bed for camping or just need a guest bed for the occasional visitor, a folding bed is a great choice.